Unable to replicate its resilience shown in February, Dogecoin (DOGE) has not escaped the broad-based selloff gripping crypto markets today. Unable to replicate its resilience shown in February, Dogecoin (DOGE) has not escaped the broad-based selloff gripping crypto markets today. It has in fact set a new low since the January rise, hitting a low of 46 satoshi ($0.00027) on Cryptsy. This price is less than a sixth of its value of 300 satoshi traded during its February peak. Dogecoin’s fortunes have not rebounded since hovering near 60 satoshi 3 weeks ago. It has shed another 25% since then, close to 12% in the last 24 hours. Dogecoin sits in 5th in market cap amongst mineable digital currencies, 7th overall. Its total worth is now $23 million. Namecoin, valued at $15 million, is nearly within striking distance of reasserting its lead over Dogecoin. While Namecoin has also declined over recent weeks, as many altcoins have, its pace of decline is slower than that of Dogecoin. 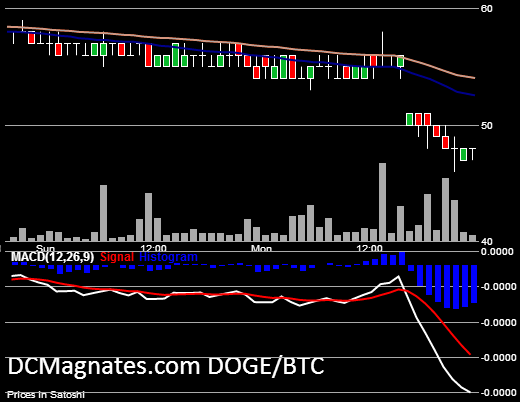 Like the declines in Bitcoin and Litecoin, there appear to be no fundamental issues hitting Dogecoin today. As assessed for Litecoin, altcoins offering little or no elements of technological originality can be the most vulnerable during a selloff. The market dismisses them as redundancies to Bitcoin. Dogecoin is a clone of Litecoin with some modified technical specifications, a minuscule denomination and a loyal, passionate community. While such traits may indeed be enviable, they may not convince a defensive market to reconsider during a downturn. It is worth noting that Dogecoin’s 12% drop today represents the greatest decline among the top ten digital currencies ranked by market cap.